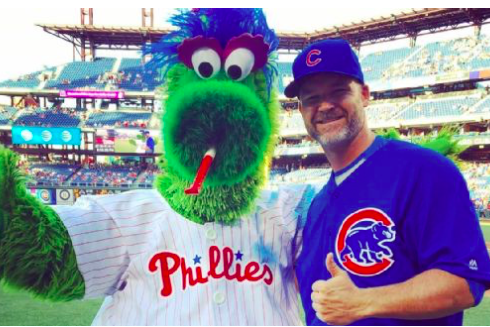 Cubs catcher David Ross poses for photo with Phillie Phanatic. If you're 39-year-old catcher David Ross and you're completing your 15th and final season in Major League Baseball, the first-place Chicago Cubs are about the best place you could have landed in 2016. Sure, they're every bit as foredoomed in the playoffs as Philly teams tend to be, but winning is a plus for your knees over a 162-game season. Actually, Ross is focused on more than baseball this season He's been making a point of seeing the sights of America whenever the Cubs hit the road. This week's stop in Philadelphia gave him a perfect opportunity to soak up a little history, get a taste of a cheesesteak and take a closer look at the Phillie Phanatic, who makes no sense to lots of people and may have been put on Earth just to torture Tommy Lasorda. Ross spoke to ESPN about his goals in Philly and explained that he's made the most of his down time. Well, he and teammates Jason Heyward, Anthony Rizzo and Matt Szczur (a Villanova graduate) made their rounds this week and here's what Ross had to share. Next up for the Cubs are the Atlanta Braves, where Ross spent four seasons between 2009-2012. Just as Philly approved its soda tax, he can hit the World of Coca-Cola museum.